From the fourteenth to the twentieth of May we were in Mexico spending as much time as possible watching birds of the Yucatan Peninsula while navigating through a variety of activities as required by a pending family wedding. Of course some time had to be spent also at the beach under a coconut palm tree just lazing around and watching the incredible blue-green waters of the Mayan Riviera. Things just do not get any better than that. 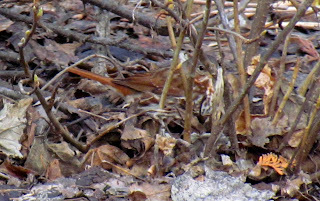 On the birding front we saw three 'lifers" and became reacquainted with several others from our past birding efforts managing to get some good photos from both categories. Although there were birds everywhere we were fortunate enough to be able to see most of them from the third floor balcony of our hotel. From a hiker's perspective, the hotel complex is built in such a way that much of the original jungle is still intact among the buildings and a walk anywhere on the grounds means a walk on a hard surface path through an actual forest. 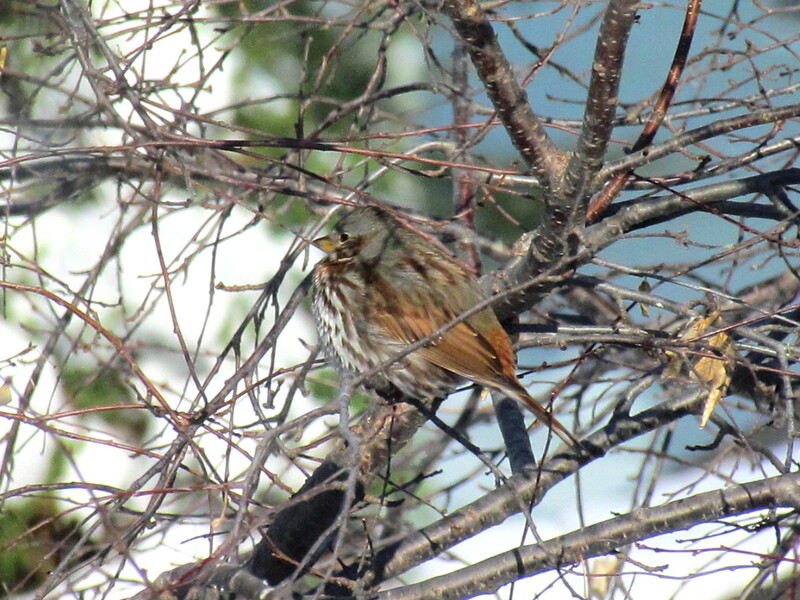 All of this makes for very easy and very comfortable birding. To top it off (pardon the pun), our balcony was above the height of the trees and I was able to get a top down view of birds that normally stay in the treetops. Great! This week I am covering two birds that have names that evoke the question, "How did they get their names?". 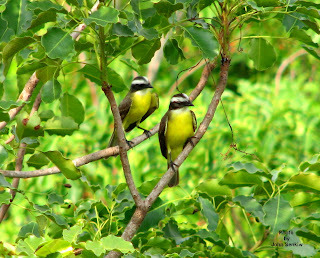 The first such bird is the Social Flycatcher which looks like a smaller twin of the Great Kiskadee (see article No. 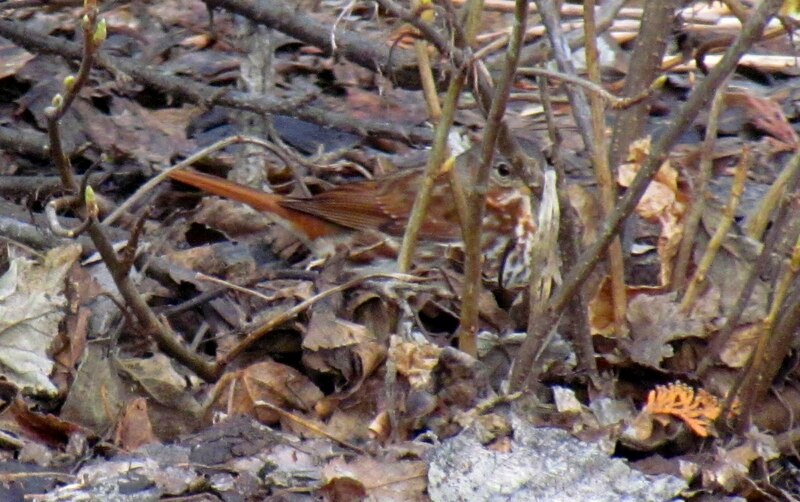 38) and can easily be mistaken for it but for its completely different vocalizations. It is called "Social" because it is seldom seen alone, rather it is usually in small groups ranging from two or three birds to six or seven, perhaps family groups. Like the Kiskadee, it is very confiding and can be approached quite closely before flying away. The second bird is the Melodious Blackbird which looks like a larger version of the Brewer's Blackbird found around our area (see article No. 4). 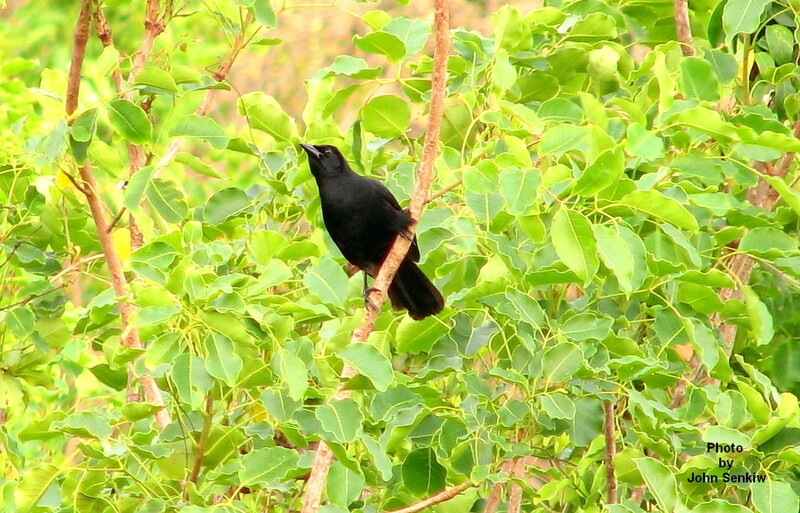 The name, Blackbird, is self evident but the name, Melodious, not so much - even when it "sings". The phrase "relatively speaking" definitely comes into play here. Compared to the thrushes, mimics and many sparrows it is not very musical at all, but compared to its blackbird relatives it is rather, well, melodious. To me, this bird squeaks and squeals in a somewhat musical way as compared to the outwardly harsh pretend singing that our local blackbirds voice. However, there was more to it all than just simple singing, musical or otherwise. Having several Melodious Blackbirds vocalizing just outside our balcony doors gave everything a very tropical flavour as it were. We definitely knew we were somewhere exotic. Both of this week's pictures were taken from the balcony of our hotel room. Compare these photos with the ones from the 4th and 38th articles for the aforementioned similarities. Whenever I think of transient birds my mind usually recalls the various sparrows such as the White Throated, White Crowned, Harris and Lincolns that occur regularly in our backyards and are presently here. However, there are many other transients, waders for example, that never visit our yards but are quite common in rural areas. 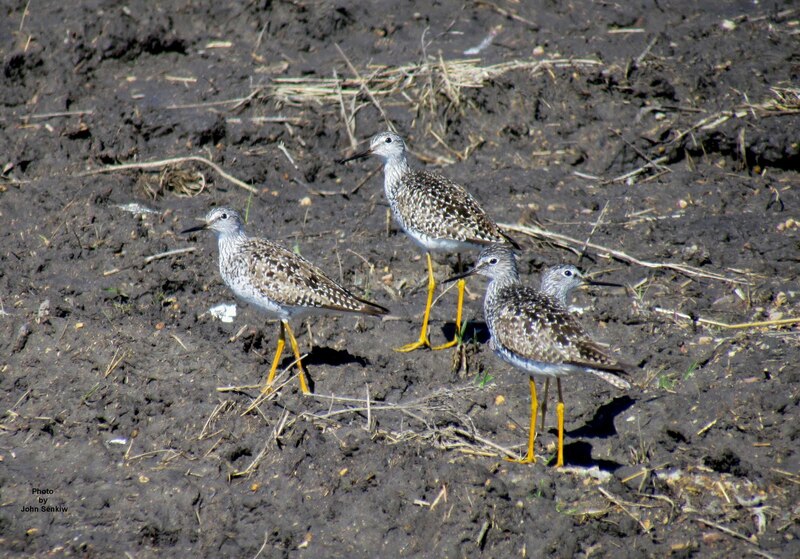 This spring I happened to see several different waders and from that group decided to feature the Lesser Yellowlegs. The Lesser Yellowlegs is a smaller version, a twin as it were, of its close relative the Greater Yellowlegs that was covered in Article No. 22. Just about everything that was said about the Greater can also be said about the Lesser. So, what are the field marks that can be used to tell them apart? In mixed flocks the size difference is very noticeable and can be used with confidence. If the birds are not in mixed flocks, there are two differences that are not too subtle and can be used to determine which is which. First, the distress call of the Lesser, when scared up, is a rather gentle two note yew yew; the distress call of the Greater is a much more pronounced three note dill dill dill. Second, if the birds are silent, bill length can be used with good reliability in much the same manner as is used to distinguish the Downy from the Hairy Woodpecker. (See Article No. 27). The bill of the Lesser is finer, straighter and shorter than the heavier, slightly up- curved and much longer bill of the Greater. The bill length of the Lesser is just slightly greater than the distance from the base of its bill to the back of its head; The bill length of the Greater is almost twice as great as the distance from the base of its bill to the back of its head. This week's photo was taken this spring near a widely flooded Waldsea Lake just north of Humboldt. The birds in this instance were easy to identify because they were accompanied by the much larger Willet (not in the picture) which is approximately the same size as the Greater Yellowlegs. In the colour photo the yellow legs really stand out immediately identifying it as one of the two species of Yellowlegs.